I may or may not have googled "how to survive a long dark winter" the other day. I normally love Fall, but after struggling through said long dark winter last year, coupled with a tough first year of grad school I am dreading busy schedules, early sunsets, and the closing of Chicago farmer's markets this Fall. Towards the beginning of August I totally panicked, thinking I had not taken advantage of summer the way I should have, and filled my calendar with summer music and film series in the parks, food festivals, and long family walks with pumpkin. We've been savoring this weather and biking all around the city for date nights in neighborhoods far from our own. We've become religious about our Saturday morning farmer's market trips. I think I bought close to 10 pounds worth of peaches last week, blanched them, peeled them, sliced them, and then froze them. I've been adoring Chicago summer, humidity and all. I worship these warm summer nights and hours of day light. Seriously, the summer can't end, I haven't even made zucchini bread yet! This pasta is light, summery, and creamy but dairy-free. Once you've soaked the cashews it comes together so easily and celebrates the simplicity and freshness of summer produce. We've been buying zucchini in bulk for what feels like pennies every week at the farmer's market and this veggie-heavy pasta is the perfect way to use them all. It also just so happens to be packed with plant-based protein (thank you nuts) and reheats great. 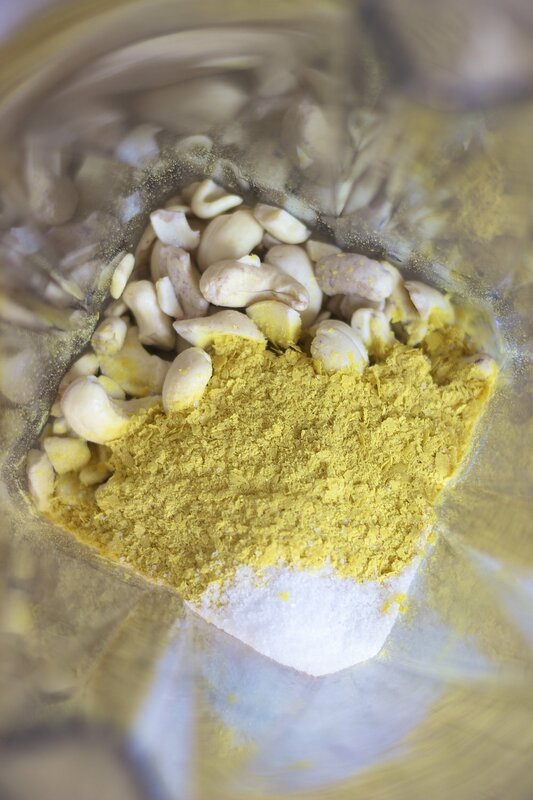 Combine soaked cashews, water, nutritional yeast, and salt in a blender and blend until completely smooth and creamy. Set aside - note, this step can be done up to two days in advance. Bring a pot of heavily salted water to a boil. Meanwhile, heat a large sauté pan over medium heat. Add olive oil, followed by the garlic, and red pepper flakes. Cook for 1-2 minutes until garlic has softened then add in the zucchini and toss to coat. Cook for 5-7 minutes, until the zucchini has softened and released some of its liquid. Remove from the pan and set aside. Once the water is boiling add the pasta and cook until al dente (keeping in mind angel hair cooks very quickly). 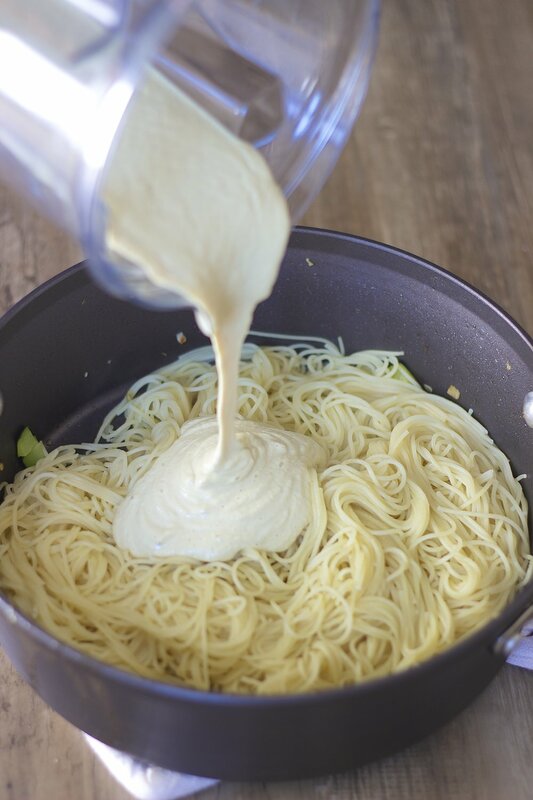 Reserve about half a cup of pasta water, then drain, and add the pasta to the sauté pan and top with the cashew sauce (you probably won't use all of it), and toss over low heat. 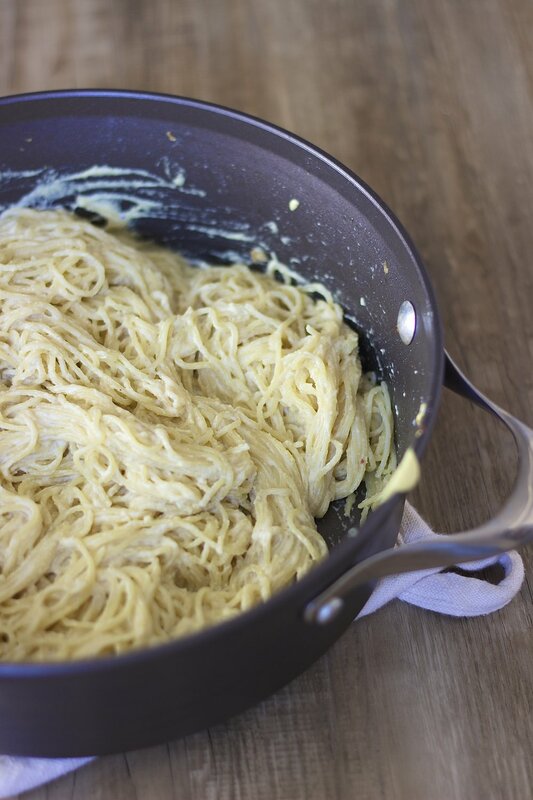 If it looks to thick, use pasta water to thin. Then top with zucchini and toss. Add in lemon zest and juice, basil and pistachios. Add salt and pepper to taste. Serve and enjoy!